“My goal is simple. It is a complete understanding of the universe, why it is as it is, and why it exists at all,” renowned physicist Stephen Hawking once said. True to his words, Hawking who explored the cosmos on a wheelchair, will forever be remembered for his unparalleled work on gravity, quantum theory, black holes and origins of the universe. Hawking died on Wednesday at the age of 76. Hawking, who was so much in tune with the universe, has repeatedly warned humans about threats during recent years. As the genius departs, a look at some of his biggest warnings for man and earth. Artificial intelligence may replace humans: At the peak of debates about artificial intelligence, Stephen Hawking gave a terrifying warning in November last year. “I fear that AI may replace humans altogether. If people design computer viruses, someone will design AI that improves and replicates itself. This will be a new form of life that outperforms humans,” he said in an interview. He feared that AI might keep improving itself and eventually rule over humans. This was not the first time Hawking expressed his concerns regarding the growth of artificial intelligence. Earlier he had warned that technology needs to be controlled, and threats of artificial intelligence identified before they escalate and destroy the human race. Stop trying to communicate with aliens: 2017 saw the launch of one of the biggest searches for extraterrestrial life—Breakthrough Listen Project—which scans the universe for radio signals. Though funded by Hawking, he had a word of caution for seekers of intelligent life who want to communicate with them. Reaching out to advanced civilisations could put earth in a risky position. "As I grow older I am more convinced than ever that we are not alone. After a lifetime of wondering, I am helping to lead a new global effort to find out," Hawking says in the film while exploring Gliese 832c, a planet that lies 16 light-years away and might foster alien life. "The Breakthrough Listen project will scan the nearest million stars for signs of life, but I know just the place to start looking. One day we might receive a signal from a planet like Gliese 832c, but we should be wary of answering back," he said in an online film titled Stephen Hawking's Favourite Places. Hawking likens our encounter with aliens to that of the Native Americans meeting Christopher Columbus—it didn't “turn out so well”. Hawking has warned that if an alien civilisation can pick up our signals, they might have the potential to be billions of years more advanced than humans, making us soft targets for an invasion. Speaking at a conference in May last year, Hawking warned that we are running out of space on earth and colonising other planets was the only way forward. 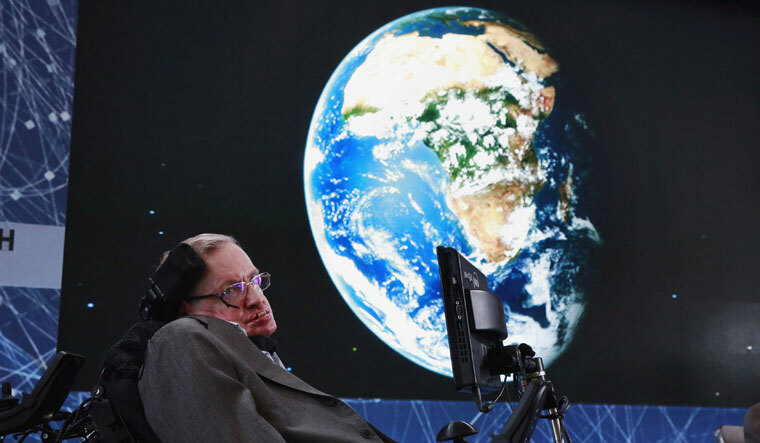 Hawking, said we must start in the next 100 years, warned the extinction of human species due to climate change, overpopulation, wars or even extraterrestrial apocalypses like an asteroid impact. Putting forward yet another ambitious option, Hawking had said countries must collaborate to create a moon colony within 30 years. Besides focusing on Mars, he also urged investors and scientific community to travel to Alpha Centauri—one of the stars closest to our solar system. Scientists believe habitable planets like earth may be orbiting the star. Hawking has warned that earth could turn into a fireball if we didn't keep a check on climate change and rising temperatures. If so, earth would end up being as hot as Venus. He said that Venus was once an earth-like planet, but a greenhouse effect burnt up the planet's oceans and lands. Now temperatures on Venus reach 250 degree Celsius. "Next time you meet a climate change denier, tell them to take a trip to Venus; I will pay the fare," he said. Hawking has also been severely critical of US President Donald Trump's decision to pull out of the Paris agreement on climate change.